Pase el día con los elefantes rescatados del maltrato durante una excursión de medio día del Santuario de la Selva de Elefantes desde Chiang Mai. 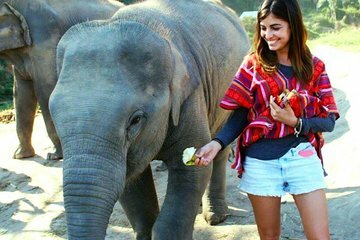 Ideal para familias y amantes de la vida silvestre, esta experiencia ética con animales le permite observar a los elefantes en un ambiente libre de abusos, e incluye un almuerzo buffet tailandés y traslados de ida y vuelta desde su hotel de Chiang Mai. Además, puedes elegir entre un tour por la mañana o por la tarde. Una duración de medio día hace que este tour sea ideal para viajeros presionados por el tiempo. Elige entre un tour por la mañana o por la tarde. This was a wonderful trip! It was small enough that you got to know your fellow traveler which is a plus when you're a single traveler. There were lots of time for interacting with the elephants and it wasn't crowded. I got to enjoy one elephant, feeding him, on a one on one basis and everyone spread out. The people working it were very enthusiastic and clearly loved the elephants and were always offering to take pictures for you so they were able to capture so really nice moments. I did not partake in bathing with the elephants but everyone else really enjoyed it and there was a nice lunch afterwards. most amazing. The staff was wonderful, the mission of the sanctuary and how to safely interact with elephants were explained prior to your interaction w the elephants. We got to feed them, give a shower to one, jump into the water pit and mud pit w the elephants .It was just great.